After LG, HTC and some of the other manufacturers have had their fun, it was Nokia’s turn to take to the stage at the Mobile World Congress2012 inBarcelonaand make some new announcements. Everyone was expecting Nokia to release a successor to the Nokia N8 and Nokia didn’t disappoint. The Nokia 808 as it is called, blew everyone’s mind with its astonishing 41 megapixel sensor, which is not only ridiculously high by mobile phone standards but even by professional digital camera standards. By now you know that the Nokia 808 has a 41 megapixel sensor. Your mind must also be understandably boggled, wondering how did they do it and is it even necessary. Regarding the first question, it definitely wouldn’t have been easy. The Nokia 808 was reportedly in development for the past five years, which is quite a lot of time in the world of technology. If you think a 41 megapixel sensor on a phone sounds ridiculous today think of what it may have sounded like five years ago. But I’m glad they went ahead with it, because it uses some of the cleverest technology seen on a mobile phone camera to date. Now coming to the second question, the answer is yes. Allow me to explain. The sensor on the 808 has 41 million pixels, more than any other camera phone out there. However, compared to other sensors, the individual pixels on the 808 sensor are much smaller, which means they would be able to capture less light and thus, less detail. How how is this better than a traditional 5 or 8 megapixel sensor? Nokia uses a technology called as pixel binning, where they use multiple pixels on the sensor to contribute to one pixel in the final image. So even though the phone has a 41 megapixel sensor, the final image can be as low as 5 megapixels in resolution. However, each of those 5 megapixels will be made up from the light information gathered by eight pixels on the actual sensor (8 multiplied by 5 is 40, which is approximately the resolution of the sensor). And because each pixel of the final image uses light from so many pixels on the sensor, the final image has a lot more detail and less noise than if it had been captured by a 5 megapixel sensor. The extra headroom in terms of physical pixels on the sensor also allows the sensor to digitally zoom into an image without loss in quality. In other camera phone, when you do a 2x zoom, the camera just takes existing pixels and blows them up by 200%. On the 808, since there are so many extra pixels, when you do a 2x zoom, you still have information from about four pixels on the sensor contributing to one pixel in the final image. You can go up to 3x zoom on the Nokia 808 without experiencing any loss in image quality. This works while recording videos too. You don’t necessarily have to shoot at 5 megapixels, however. The Nokia 808 has two options, PureView and Full resolution. In PureView mode you get low resolution options such as 8, 5 and 2 megapixels where the camera uses pixel binning. In the full resolution mode, you can go for 34 megapixel (16:9) or 38 megapixels (4:3), where you get a 1:1 image in which each pixel in the final image has been contributed by one pixel on the sensor. In the latter mode, digital zoom is not available and low light performance is likely to be not very impressive, owing to the small size of the pixels on the sensor. All of these tricks are available in video recording mode as well. 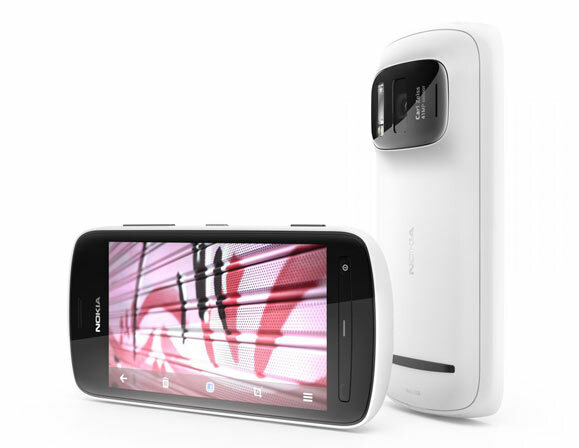 The 808 is the first Nokia phone to have FullHD 1080p video recording with 4x lossless zoom. You can also opt for 720p video recording where you will get 6x lossless zoom. Finally, the camera on the Nokia 808 also comes with a xenon flash. As you may know, xenon flash is much brighter than standard LED flash. The one on the Nokia 808 is even better and almost twice as powerful as the one on the Nokia N8. Now let’s move away from the camera for a while and take a look at the rest of the phone (sometimes it’s easy to forget that there is also a smartphone behind that camera). The Nokia 808 PureView is a Symbian Belle smartphone. It has a 4-inch AMOLED ClearBlack display with 640 x 360 resolution, 1.3 GHz single-core processor, 512MB of RAM, 16GB internal memory with microSD card slot, HDMI-out, Wi-Fi, DLNA, GPS, NFC and USB On-The-Go functionality. As you can see on paper, the rest of the smartphone doesn’t quite manage to impress as much as the camera alone does. That’s mostly because it is running on the Symbian platform, which Nokia itself thinks is a dying platform. Not only does the OS not match its more modern rivals such as iOS, Android or Windows Phone it also lacks severely when it comes to third party applications. Thankfully, Nokia has announced that the PureView technology will eventually make its way to Window Phone devices. The Nokia 808 PureView is expected to release this year in May. We really can’t wait to get our hands on it.